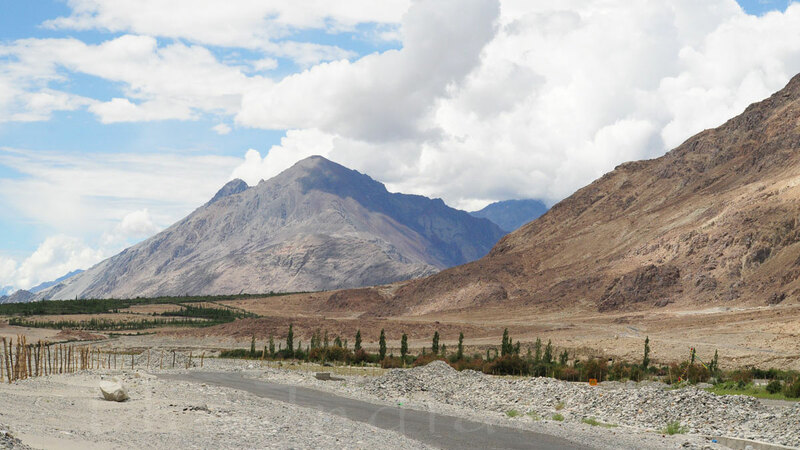 Ladakh being a region in J & K, is one among the most beautiful Indian holiday destinations. You must have seen it in movies, and must have read a lot about it. 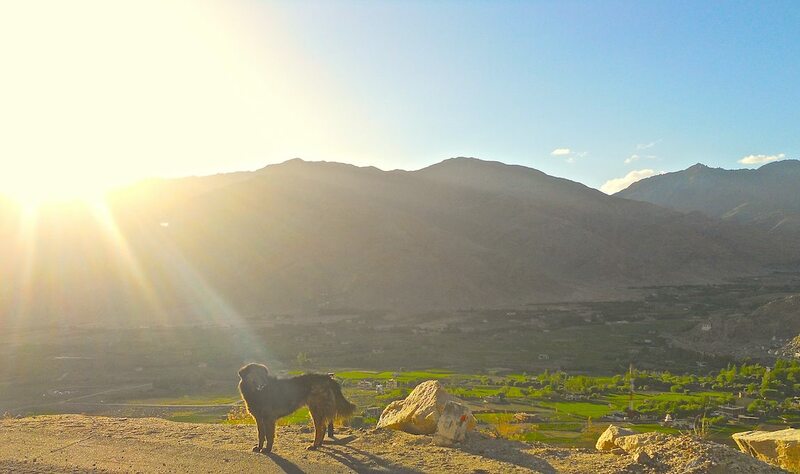 I hereby, take the opportunity to share the real Ladakh from my eyes. The trip was in June. Arrived at Kushok Bakula Rimpochee Airport in Leh at 7:00AM. Weather was fine as temperature was around 8°C. Driver drove us to our hotel. Post breakfast, we slept for 5 hours. After 1 hour of lunch break, we slept again for 3 hours. We spent evening hours in Leh market for shopping. Because of high altitude, we were finding it hard to walk. We halted at many places. In sunset hours, driver took us to Shanti Stupa. Post dinner, we decided to take rest and sleep by 9:30PM. The day was relaxed and calm. Our good morning began at 7:30AM. We felt out night to be too cold being it was our first night spent. Post bath and breakfast by 9:30AM, we headed to Uley. Before heading up we bought fruits and water bottles from Leh market. En route for Uley; we visited Guru Pathan Shaheb, Magnetic Hill and Sangam of Indus and Zanskar River. We reached Uley Ethnic Resort at 1:00PM. Post lunch, at 2:30PM, we headed to Lamayuru Monastery. We came back to Uley Resort at 6:30PM. Post evening tea, we headed to Indus Bank for relishing the evening hours. Chilling weather forced us to sleep at 9:30PM after dinner. The day was full of sunlight. There was less of breathing problem as Uley’s altitude is lesser than that of Leh’s. The night was comfortable. We woke up at 7:15AM. Morning was leisurely for us. Post lunch, at 2:00PM we headed to visit Alchi and Likir Monastery. We returned to resort at 5:00PM. We spent evening hours at Indus bank in clicking pictures. Delicious dinner at 9:00PM made us sleep by 10:30PM. The day was bright. Sight of Indus Valley made this place worth staying. Uley weather’s was comfortable and we had calm sleep last night. We woke up at 6:00 AM. Having bath and breakfast we left at 9:00AM. It was 3:00PM when we completed sightseeing at Thiksey Monastery, Shey Palace and Leh Royal Palace. After having lunch at Leh market, we reached at Leh Guest House at 4:15PM. We slept for two hours and left at 5:30PM for Leh market. Post dinner at 9:30PM we decided to sleep. We woke up at 7:00AM. Having bath and breakfast we headed for Hemis Monastery at 9:00AM. Amid we had loaded our taxi’s back space with 30 liters of mineral water. Note that: 1 liter water bottle cost around Rs. 40/- in Pangong. At 12:30PM we headed for Pangong. We touched Chang La Pass at 2:00PM and took 15 mins tea break. We reached Pangong at 4:30PM. Welcome tea awaited us at Camp Sambhala. Lake shore is perfect destination here for photography. We clicked moon rise. Post dinner, we decided to sleep at 9:30PM. The night was slightly restless for us. Temperature was around 3° C and wind was blowing at 35kms/hr. We had tent accommodation. But we would recommend you a hard wall accommodation to be comfortable in icy weather. Morning was beautiful here. By 2:00PM we sat on lakeshore to adore beauty. Having lunch, we slept for 2 hours. Evening hours are superb for lakeshore photography. Post dinner we re-cherished moon rise. It was almost full moon. We slept at 9:30PM. In Spangmik village, you get satellite phones to make calls @ Rs. 5/- per min. Pangong changes color from 3:00-7:00PM. Click the sunrise and sunset for matchless beauty. Spending time in the full moon night to observe the beauty would be a great idea. Remember to avoid daytime sleep, spicy and oily food as you would be at a high altitude. Lowering temperature made us uncomfortable in the night hours hence we had an early good morning at 5:00AM. We decided to move for morning photography. Having bath and breakfast, we headed for Chumathang at 7:20AM. By 10:00AM, we reached Chang La Pass. After 15 mins of tea break we headed for Karu. It was 12:00PM, when we reached there. We bought fruits from here for next day. Halting for altogether 45 mins we headed for Chumathang. Our driver took his lunch during this halt. We were at Chumathang when clock showed its 4:00PM. A 2 hours power nap was what we needed the most. It was a pleasure and fun having bath in hot spring water. Later on, evening was spent at Indus bank. It was 9:30PM we decided to pull up the blanket after dinner. Our stay was at Hot Spring Resort. The night was pretty comfortable and we woke up at 6:30AM. Post bath-breakfast, we headed to Tso Moriri Wetland Conservation Reserve at 8:15AM. By 10:45AM we reached there. A hot and soothing Masala tea welcomed at Tsomoriri Camp and Resort. We had siesta for 2 hours. At 3:00PM we went to lake side for photography. Clicking Mountains around for panoramic view of lake was just awesome. Regrettably we were unable to visit monastery. Post dinner at 9:30PM we decided to sleep. At 2:00AM light rain started thus making our night frightening. Abrupt downfall in temperature made us little nervous. Next morning was cloudy owing to it we seen lake color during sunset only. In hazy days, Ladakh appears to be black, white and grey. As it was cloudy with a little of rainfall we decided to checkout by 7:15AM and headed for Tso Kar. Lastly at 3:00PM we reached Leh. Post lunch we went to shop in local market. We reached Guest house by 5:00PM. Keeping in mind the cleanliness these places have, we carried all our garbage from Pangong, Chumathang and Tso Moriri to Leh. We had an early good night today by 9:00PM. Night was pretty comfy and we woke up at 4:45AM as we had flight to New Delhi at 5:45AM from Leh Airport. Airport authorities allow handbags with camera, mobile, laptop, water bottle and clothes. We stayed here for 3 nights. Owner family is welcoming. They served home made less spicy veg food. Bread, Butter, Jam, Tea, Oats, Egg and Fruits for breakfast and Chapatis, one Green Vegetable, Dal, Rice, Curd, Pickle and Salad for lunch and dinner were served. In totality food was decent. Veg and less spicy food is being served owing to more foreign traveller. Bread, Butter, Jam, Tea, Oats, Egg, Paratha and Fruit Plate is offered for breakfast whereas Chapatis, 3 Vegetables, Dal, Rice, Soup, Papad, Pickle, A Sweet, Noodles and Salad for lunch and dinner. Evening tea with biscuit is served as well. 2 complimentary mineral bottles per day are also offered. 1. Huts were small but hygienic. 2. Ours was Eco Hut stay. 3. There was shared lavatory for hut accommodation. 4. Hot water is available for 24 hours. 5. Property is having Apple and Apricot trees. 6. Indus River view was admirable. 2 nights were spent here. This is deluxe tent accommodation in Spangmik. We felt real Ladakhi hospitality. Veg and less spicy food is being served owing to more foreign travellers here as well. Bread, Butter, Jam, Tea, Oats, Egg, Paratha and Fruit Plate is offered for breakfast whereas Chapatis, 3 Vegetables, Dal, Rice, Soup, Papad, Pickle, A Sweet, Noodles and Salad for lunch and dinner. Jain food is available on demand. No complementary water bottles are offered. 1. 1 bucket Hot water is available in morning. 1 night was spent here. It is the largest and oldest tent accommodation in Karzok with nice hospitality. Owner is from Deharadun. Veg and less spicy food is being served owing to more foreign travellers here as well. Bread, Butter, Jam, Tea, Oats, Egg, Paratha and Fruit Plate is offered for breakfast whereas Chapatis, 3 Vegetables, Dal, Rice, Soup, Papad, Pickle, A Sweet, Noodles and Salad for lunch and dinner. No complementary water bottles are offered. 1. Tents are old and small size with attached toilet. 2. 1 bucket Hot water is available in morning. 3. Electricity is available from 8:00-11:00PM. 4. Rats made our night restless. 1 night was spent here as well. This is a 4 rooms accommodation adjoining to hot spring in Chumathang. Veg and less spicy food is being served owing to more foreign travellers here as well. Bread, Butter, Jam, Tea, Oats, Egg, Paratha and Fruit Plate is offered for breakfast whereas Chapatis, 3 Vegetables, Dal, Rice, Soup, Papad, and Pickle for lunch and dinner. No complementary water bottles are offered. 2. Rooms are very old with attached toilet. 3. 24 hours Hot water is available from spring. 4. Electricity is available from 8:00-11:00 PM.